Safely and securely place your iPad on display. 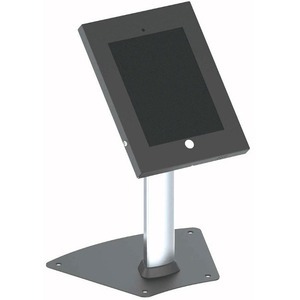 The Pyle PSPADLK12 iPad enclosure and stand provides companies and merchants with a simple, state of the art, solution for information access and digital signage. Reinforced kiosk is constructed from fortified steel and heavy-duty aluminum ensuring the safety of your device when inserted. Use the iPad safety enclosure high traffic areas such as front desks, lobbies, customer counters, work desks, or on showroom floors. With access to the Home button, users will be able to interact with on screen content and navigate programming and menus. Mount your tablet in landscape or portrait modes with up to 90° of vertical mobility. Give customers or guests iPad access when you secure the stand in place and bolt it down. Works with all 2nd, 3rd & 4th generation iPads. Mount your iPad where you need it and provide convenient device access with the Pyle PSPADLK12 iPad safety display kiosk.